Asterisk has a home! This friday, we will be have a celebration and inaugural gallery exhibition featuring our published artists – Boris Jovanovic, Christina Mazza, Erik Otto, Carissa Potter, Jennifer Wasson, and Trev Yoder. The celebration and opening exhibition will be from 8-11 pm. Looking forward to seeing you!! 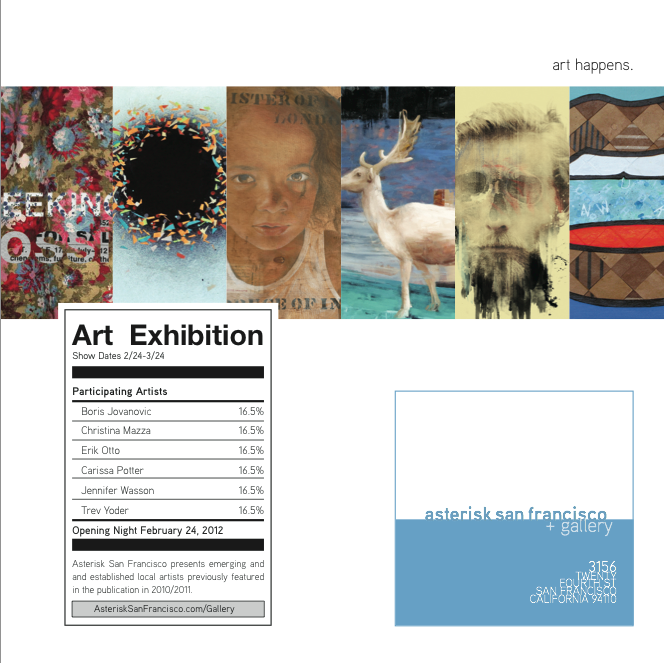 Posted in Visual Arts and tagged as asterisk gallery, asterisk magazine, asterisk sf, bay area, San Francisco. That’s a fortuitous event at a happenin’ venue! Happy for you guys…congratulations! You should definitely try and make it, if you’re able to do so. It will be a great event. I’m glad you’re glad, Liz. I’m definitely happy about all of these wonderful additions in my life. 🙂 Thanks again for all of your support and wishing you were around for the inaugural exhibition. You will have to definitely visit the space when you’re in town.